No other feline has delighted me more over the years than Garfield. His zany escapades continue in the latest DVD release from Vivendi Entertainment. The Garfield Show: Dinosaurs and Other Animal Adventures (SRP $14.93) features Garfield and friends as they dig up dinosaur bones, work with farm animals and explore life under the sea. The Garfield Show is a popular children’s television program on Nickelodeon and this DVD includes six animal themed episodes. The cartoon series has high quality CGI-animation and hilarious story lines to make it interesting not just for children but grownups too. For over an hour, my children and I laughed out loud as Garfield planned to dine on a goldfish and went on other silly adventures. 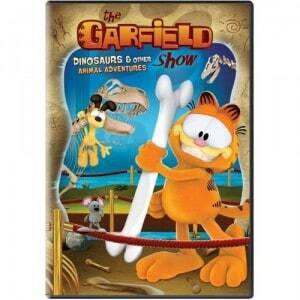 The Garfield Show: Dinosaurs and Other Animal Adventures is a fun, enjoyable DVD that is available for purchase from Amazon.com as well as other retailers. One lucky reader will receive a copy of The Garfield Show: Dinosaurs and Other Animal Adventures! I’ve never seen The Sting, but heard it was good…I’d like to see it. I would like to see WWE SUMMERSLAM 2011 BLU-RAY. We like veggie tales Larry learns to listen.